When venturing on a fall foliage tour, there’s no better place than the Poconos. The region is known for spectacular autumn colors that peak three separate times throughout the season, and the colorful driving routes teeming with charming towns, local breweries and wineries, and outdoor adventure. So hop in the car and start exploring the Pocono’s best done-in-a-day fall road trips. The town of Jim Thorpe is a Pocono Mountains gem. A hundred years ago, it was a hub for coal mining, and the titans of the industry built beautiful Victorian homes there. Today, these houses are restaurants, shops, museums, and galleries that make up part of the charming downtown. Jim Thorpe is also home to the Lehigh Gorge Scenic Railway, which uses vintage coaches (from as early as 1917) pulled by diesel engines. Passengers can enjoy a comfortable, narrated trip along the Lehigh River and into Lehigh Gorge State Park. You can catch the autumn leaf action on a 25-mile journey on the Bike Train. Ride the train up the Gorge past high cliff walls and the mighty Lehigh River. Then, rent or bring a bike to ride back to town along the same path at your own pace, pausing to take leaf peeping pictures at your leisure. October weekends bring the Jim Thorpe Fall Foliage Festival and family-friendly fun partnered with Jim Thorpe’s colorful fall leaf backdrop. Ride the train, enjoy live tunes, get spooked on a ghost tour, and explore the town. You’ll also find spectacular foliage driving Route 209 from Jim Thorpe toward Pohopoco Drive, which loops around tree-surrounded Beltzville Lake in Beltzville State Park. The historic town of Milford, Pennsylvania is filled with old mansions, unique shops, and excellent dining options. Do leaf peeping right; take a break from the car for a quick kayak or canoe trip down the untamed Delaware River surrounded by autumn leaves. The sparkling blue waters paired with vibrant colors make for epic photos, and local liveries will transport you and the equipment to and from the river. Or take the free River Runner shuttle from Delaware Water Gap National Recreation Area to four spots along the Delaware. Paddle from any drop-off point to the town and beach of Milford, Pennsylvania. 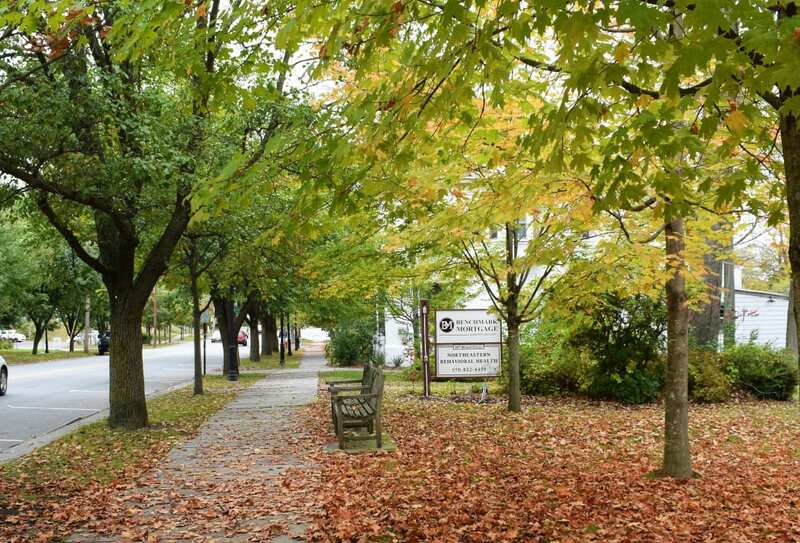 Modeled after Philadelphia’s design of streets and alleys, Milford is filled with magnificent old mansions, curious local shops, and imaginative food and drink set against a backdrop of colorful changing leaves. Enjoy the craft cocktails at classy Bar Louis at The Hotel Fauchere. Next, take a break on the Delaware River at Milford Beach for relaxation with riverside views. End your fall color tour with an easy waterfall hike to the three-tiered Raymondskill Falls, the tallest waterfall in Pennsylvania. Get fall color with a dose of history in the all-American, Pennsylvania Coal Country town of Honesdale—also known as the “Birthplace of the American Railroad.” The first steam locomotive to run on U.S. commercial tracks chugged through Honesdale in 1829, and today visitors can still ride the rails on The Stourbridge Line’s scenic train trips. Take in panoramas of changing leaves aboard the Glen Eyre Express, a two-and-a-half-hour route departing from Honesdale and traveling through Hawley up to the old Glen Eyre station stop. Gorgeous colors and Lackawaxen River views make for a spectacular autumn ride. From Honesdale, drive one of Pennsylvania’s best fall color roads, Route 6, to Roebling Aqueduct Bridge; the nation’s oldest wire cable suspension bridge. Constructed in 1847 to support the bustling D&H Canal, today you can still walk or drive the bridge across the state-line into New York. Enjoy autumnal vistas as you amble along the former aqueduct where canalers and their mules once traversed the D&H Towpath. 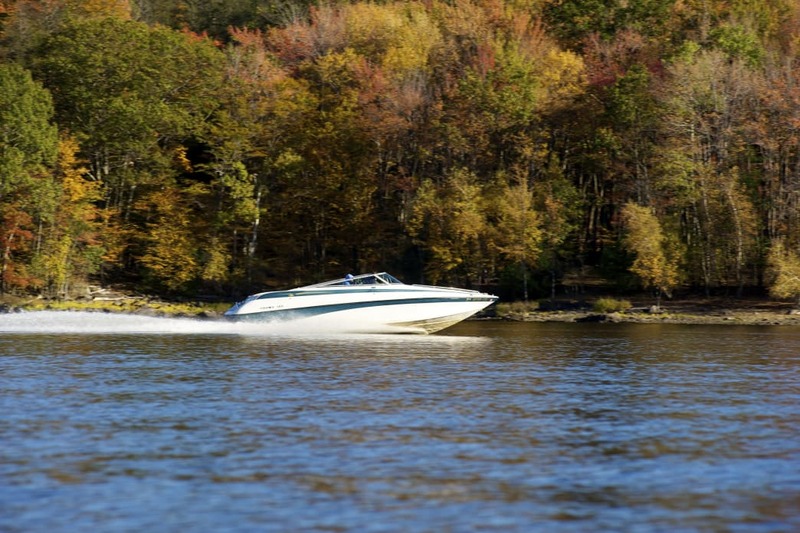 Lake Wallenpaupack is one of the region’s best destinations for fall colors. It would be remiss to skip another section of Pennsylvania’s scenic Route 6. One of the first transcontinental highways, the quiet Route 6 roadway spans the Upper Delaware River and links small towns through Pennsylvania Coal Country. This section heads off the Delaware Water Gap National Recreation Area and some of the state’s tallest waterfalls. Follow Route 6 on toward Hawley, a Pocono Mountains town known for farm-to-table dining, markets, and music. On October 13, Hawley Harvest Hoedown takes over the town. Schedule your road trip around the festival to take part in tours, tastings, and hayrides all accompanied by fall leaves. When departing, turn off Route 6 and follow Route 507 around Lake Wallenpaupack for what is arguably one of the Poconos&apos; best fall foliage drives. Expect vibrant tree leaves in shades of red, orange, and yellow reflecting off the sparkling blue lake’s 52 miles of shoreline. Stick around for sunset when colorful skies complement the changing trees. If you can’t get enough of the fall foliage, dine or stay dockside at Silver Birches Resort and The Dock on Wallenpaupack for the lake’s best food and views. Find endless back country Pocono Mountains vistas on the winding paved road to the top of Camelback Mountain. Rising 2,100 feet above sea level, the mountain offers views stretching all the way to New Jersey and New York. Big Pocono State Park is enjoyed during the summer and fall as an outdoor hiking and picnicking paradise. Bring your own eats to enjoy at the provided picnic tables, or dine on the deck at Camelback Mountain’s Kartrite&apos;s Summit House restaurant. By fall, you can take in the autumn leaves in peace while seated or in activity while hiking. Want to work for your foliage? Follow the challenging trails that twist around the mountain to incredible overlooks. Afterward, wind down with local beer at Barley Creek Brewing Company, just a seven-minute drive from Big Pocono State Park. If wine is more your taste, visit Sorrenti Cherry Valley Vineyards, a 20-minute drive from the park. Written by Jenny Willden for RootsRated Media. The Black Bear Film Festival celebrates it&apos;s 20th Anniversary this year. The BBFF is one of Pennsylvania&apos;s premier independent film festivals. See when the trees will reach their peak in the Pocono Mountains&apos; three distinct color zones!